The cutest plant sale in all of Toronto is happening the day before Mother’s Day…just in time! 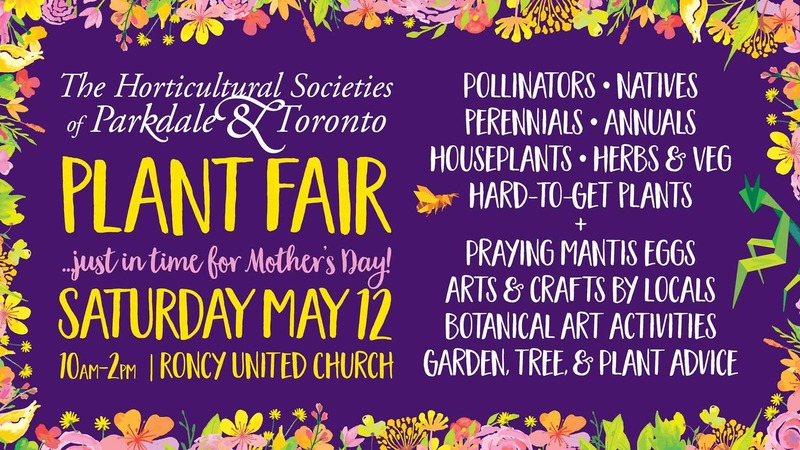 Head to the Roncesvalles United Church (214 Wright Ave.) between 10 a.m. and 2 p.m. to find amazing garden items and plants at really good prices (bring cash). You’ll also find arts and crafts from local artisans, praying mantis eggs to hatch at home (for real), plant & eco-friendly gardening tips, a Green Elephant flea market, and botanical art activities for all ages. This Plant Fair is the main fundraising event for The Horticultural Societies of Parkdale & Toronto, so take pride in knowing that the proceeds from your purchases will be going towards all sorts of greening initiatives, community garden projects and horticultural educational outreach.